Whether you want an colorful, urban, and Austin-y background or an old barn and tall grass to set the stage for your session, we will collaborate on the perfect location to match the style you’re looking for. The most important thing is that you and your family are comfortable! That being said, focus on coordinating colors and textures, not matching absolutely everything. Also, consider the decor in your home--what colors would you like to see every time you look at that displayed image? Pinterest is a great spot to look for suggestions! Your images will be delivered to you digitally within two weeks of your session date. Do you photograph events and/or weddings? I do photograph a small number of weddings each year. If you have a wedding inquiry, please contact me for more information! I do not do other event photography at this time, but I am happy to recommend one of my other photography friends to assist you! Nope! I am a firm believer that the images we capture during your session are yours to print and share as often as you would like. I will gladly recommend some of my favorite places to print images if you need suggestions. Do you offer any combination packages? I’m so glad you asked! Click here for more information about my combination session packages. I shoot in RAW format, which means I do adjust every image to ensure it looks its best. If necessary, I perform natural skin retouching to ensure that everyone looks beautiful and natural without looking fake or plasticky! When should I schedule my newborn session and what should I expect? If you would like to schedule a newborn session, please let me know your due date so I can mark it on my calendar and plan accordingly. The ideal timeframe to photograph a newborn is within 4-10 days after birth--it is when they are sleepiest (and therefore don’t mind being photographed as much)! I will send you detailed instructions closer to your due date to ensure we get the most of our session time when the little one arrives! I completely understand that things come up and I will do my best to accommodate reschedule requests within reason. Payment is expected in full at the time of our session. I accept cash, check, and Venmo (isn’t technology great)? I do offer a limited number of seasonal mini sessions several times a year—these book up quickly, so if you’d like to get on the list to know when they are available, please let me know! 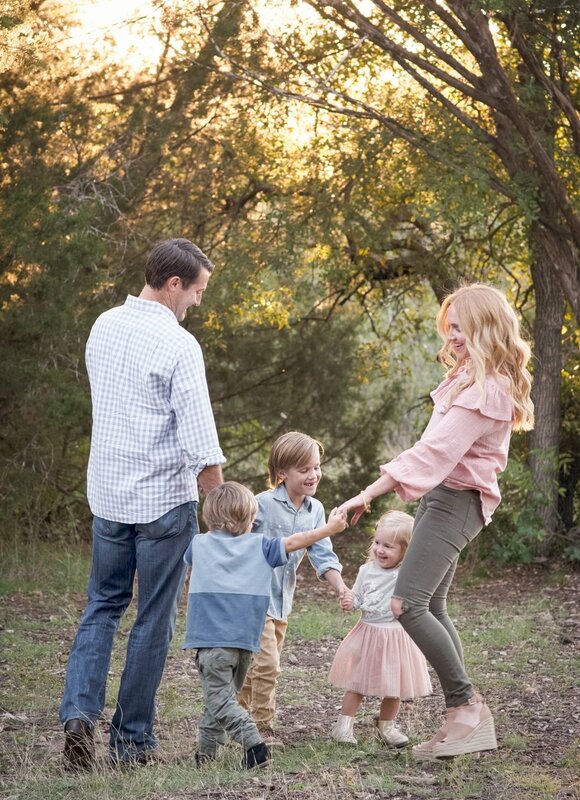 The best time for an outdoor session is either early in the morning (up to about an hour after sunrise) or about an hour before sunset--this allows for the yummiest, softest, most even light and helps to avoid both harsh shadows and the wrath of the midday Texas sun! Believe it or not, cloudy days make for gorgeous photos, because the light is so soft, diffused, and even, so don’t be afraid if our session day turns out cloudy! That being said, if it is pouring rain, we will reschedule to another day. No problem! Just click here and ask away!